added 15 additional animating textures. Wad files required to run the map: "halflife.wad;liquids.wad;"
Increased 3176 clipnodes to 3232. Check the file E:\SteamLibrary\steamapps\common\Half-Life\valve\maps\reception.log for the cause. So another problem has arisen. The map took ages to compile and when it did the lighting was still off. I looked at the log and it's telling me that the map is too complex and I need to switch to 64bit hlrad but I don't know how to do that. Also there's some strange yellow particles floating around a scientist I placed and I don't know why. Thanks for replying though. What happened is basically that HL RAD ran out of available memory. How much RAM do you have? If you've got more than 4 GB, you should definitely try running the 64-bit version of RAD. Basically, you can switch to the 64-bit version by going to your settings, and changing the build tools, or compile tools, or something third, depending on how the map editor calls it. Simple as that. 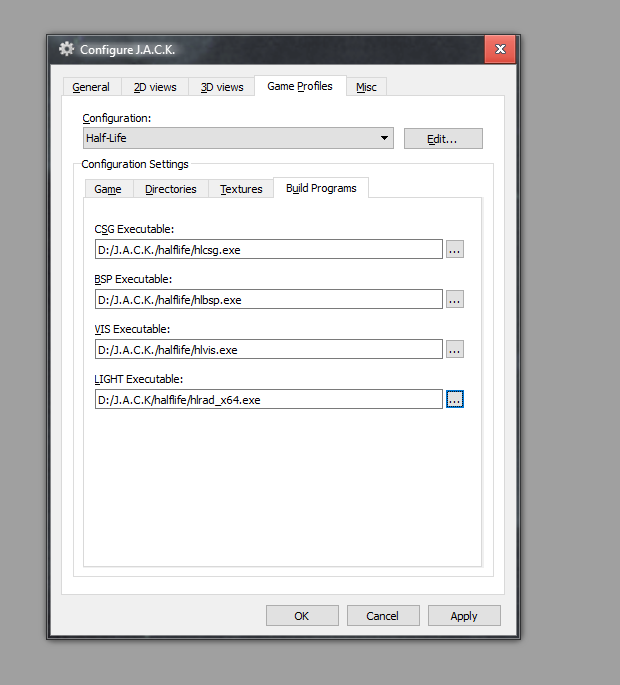 If you can't use the 64-bit version, or you have even less than 4 GB of RAM, well, you can use less textures, since J.A.C.K. can use lots of memory if you're using too many WADs. If that doesn't do it either, then you can resort to the Compilator 3. It's sweet and manages the compilation process for you, and in some cases it can make it a bit faster when the map editor is closed. As for the leak, I'm thinking you've now made a huge hollow box around the map. Don't do that. You can read about leaks here. If you have small gaps that cause a leak, simply close them with either extra brushes, or by extending a nearby brush. The strange yellow particles are probably there because the scientist, or a part of the scientist, is inside of the floor or any other solid. Make sure he spawns in the air, if you can't get rid of the particles otherwise. I’m currently working on that issue. For now I’m going to be asking a lot of questions if you don’t mind. At the beginning of the map there’s a trigger that activates a multimanager which activates both a scripted sentence and an on screen message. However the problem is that for some reason the message appears right on que but the sentence takes a few seconds to activate. I’ve checked and there’s no value in the delay before activation tab nor in the multimanager so I don’t know what’s going on. Also I’m trying to get a scientist to loop between two scripted sequences but the problem is that he goes to one and just stays there. ALSO at a later part in the map a vehicle is supposed to traverse across the map from one point to another. There’s no problem here it works fine but I’m wondering if there’s a way to get it to make a sound without giving it a move sound (because I made it a door entity) and just swapping that sound file in the mod folder with the desired sound. If you know what I mean. "Also I’m trying to get a scientist to loop between two scripted sequences but the problem is that he goes to one and just stays there." Each scripted_sequence should target one another. seq1 targets seq2 and vice-versa, for example. I've done that in my mod once, but not sure if I used aiscripted_sequence or the regular scripted_sequence. "However the problem is that for some reason the message appears right on que but the sentence takes a few seconds to activate." You could delay the text message. I'm not sure what causes this. Try turning on the "multi-threaded" flag in the multi_manager. Or delay the message by 0.01 seconds, and have the sentence without delay. "I’m wondering if there’s a way to get it to make a sound without giving it a move sound"
Yeah, you can use an ambient_generic entity, with initial volume set to 10, start silent and medium radius turned on. Then as you trigger the vehicle, you will also trigger the sound-emitting entity. The only issue there is that the sound will always be emitted from the sound entity's position, meaning that it is going to sound strange if the vehicle is already far away, but the sound remained still. Thanks, I was worried I might not get anything. Sorry my reply was a bit vague because I was rushing it. The two scripted sentences do both have each other’s names in the target boxes. 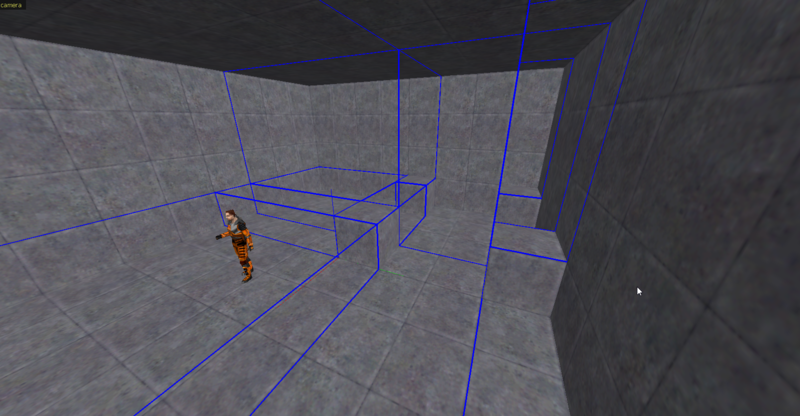 I have learned to uncompile half life maps to view in the editor to see how valve have done it (I’m not trying to steal anyone’s maps or anything in case that’s what you might be thinking) and I noticed they used things called ai nodes. I’m wondering if these could have a role in scripted sequences? I’ll see what I can do with the multimanager and the vehicle. It's okay. The situation has been contained. All I needed to do to make the sequences loop was check the repeatable flag for each one. The scripted sentence and the screen message problem appears to have resolved itself. AI nodes are just a 'GPS system' for the NPCs. When you place these nodes, you're giving NPCs confident information as to what way they can go. Without nodes, they use pathfinding and sometimes they're not too good at it. Confident as in, the AI will be 100% sure what way to go. Should the way they go be correct or not, eeeeh, it depends on the mapper and how the nodes are placed. Pretty sure he'd have the same questions and problems even if he had used Sledge (if not some more stability issues too). Though, what I've just said won't be valid after the next couple of years. So now this problem has just arisen. I'm trying to get a guard to say something and afterwards proceed to walk over to a button were he'll do an animation and the door will open. I think this has done something because now I get this error. And it goes on for ages. The hlvis supposedly froze at one point so I cancelled it. Only when the map started, no scripted sentences worked. Also what's wrong with J.A.C.K? If HL VIS is stuck, your map needs some optimisation. Can you show us some screenshots of the map? Usually, tiny brushes that are merely architectural details (or even prop-like things like signs, fences, railings, tables, chairs, lamps, small rocks etc.) should definitely be func_detail. The compile warning is really just a warning. It also means that the geometry is a bit funky or unusual, so the compiler can interpret the geometry in more than one way (hence ambiguous). Generally, it's completely fine, not much to worry about. Are you triggering the sequence that the guard is supposed to do? Some more context is needed, and some of the keyvalues that are being used by the entity setup. Try the aiscripted_sequence entity, too. You can open your map's portal file to analyse what VIS has to calculate. 4 688 45 ( 400, 500, 600 ) etc. The last line that I wrote won't actually look like the one in a .prt file, but you can get the idea. This file is generated per each compile. Then, you open the .prt file with the map editor: Map->Open Portal File. Hold on, I'm currently in the process of completely refurbishing my map. I can provide screenshots once it's finished. Also what's the difference between a regular scripted sequence and an aiscripted sequence? Don't they both do the same thing? Yeah, the guard is supposed to say something and once finished proceed to walk towards a button and press it. This in turn will open the doors. Everything is set up like it should be, there aren't any problems that I can find. I could try and use an aiscripted_sequence entity instead but I'm not sure exactly in which way. I once made a mistake when I placed an aiscripted sequence instead of a normal one and the sequence didn't work so I can't say I really trust them. Also... func_detail. How do I know which details to assign this entity to? And also what exactly does it do? Sorry about all the questions, my knowledge on the Goldsource engine is quite limited. An aiscripted_sequence forces the AI to do it. It's like the God of AI, even prevents death while it's being executed. func_detail basically prevents the "cutting" of portals, and lets you control the contact BSP face splitting. Now what would happen if we assign func_detail to these boxes? Secondly, these boxes would not "cut" the floor into multiple faces as they did previously. I added another block there just so the portal file wouldn't be empty. 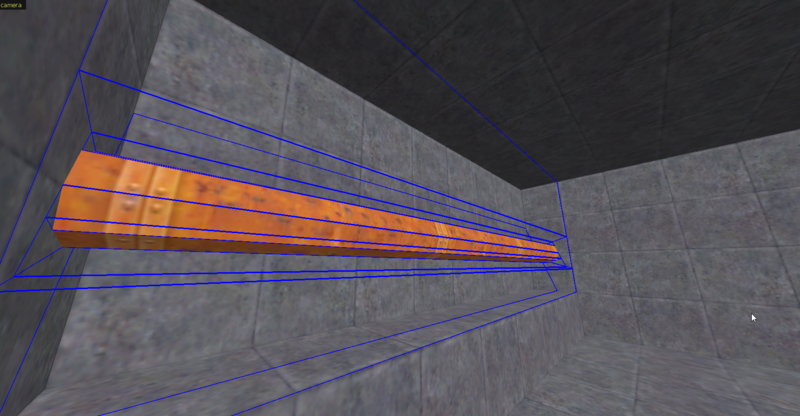 Basically, func_detail simplifies the map's portals (these blue rectangles), but it should absolutely not be used on walls, ceilings etc. It acts as a non-entity, but it'll still be treated as an entity by the compiler, so it won't block any leaks. Each of these volumes defined by these blue boundaries can be considered a room. Basically, VIS thinks there are multiple rooms in there, while it's just some space around a pipe. Doesn't make much sense. So it should be func_detail. You can use func_detail on basically anything that causes unneeded complications in VIS calculations. Chairs, tables, lamps, maybe window frames, furniture, static vehicles, pipes, signs, poles etc. should all be definite func_detail candidates. Yeah that makes sense. Only problem now is how I bring up these blue lines so I can see what's causing the issue. Also these so called "sins"? I'm not entirely sure if I've already committed any of these but now I have a sinking feeling that I have. Oh great, now ANOTHER problem has arisen. I deleted a bunch of stuff in the map for the "refurbishing" and now I can't compile the map because it tells me there's a leak. I try and follow the point file but it doesn't lead to anywhere. It just stops in the middle of the void. It's also curling around other stuff as well and I feel like that's trying to tell me something. I have literally no idea why this is happening because the entire map is completely sealed off from the void. "Only problem now is how I bring up these blue lines so I can see what's causing the issue." 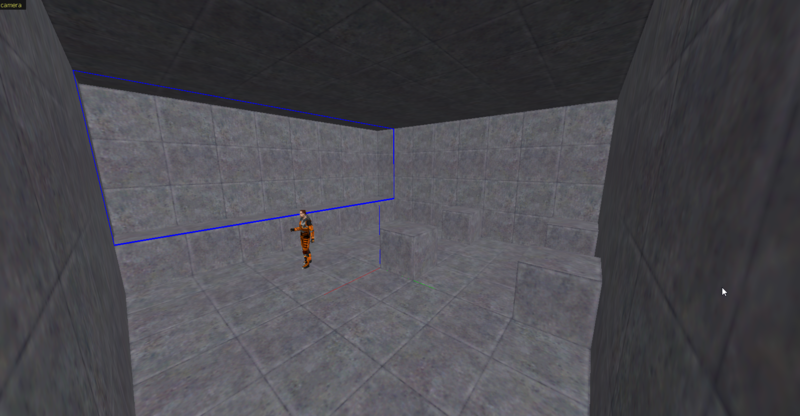 BTW you might wanna check if you accidentally func_detail'ed a wall or a ceiling or something. This is where screenshots would come in handy. Does the line go through walls? If yes, then check for errors with Alt+P, there might be an invalid brush. And don't worry about the sins, it's a joke. Mapping is no religion. I didn't mean it. No need to be sorry. "I have literally no idea why this is happening because the entire map is completely sealed off from the void." Do you have any entities outside of the map? All entities should be inside of the rooms, even things like lights, or info_ entities etc. Also what grid size are you working on? The bigger the better for map sealing brushes. Double check that joke of your world sealing brushes aren't entities by accident. Open a properties window and click each brush to check easily. Oh right, one more thing: the point file's lines actually do end up in the void in the end. The thing is, you gotta track the line to see if it's going through a brush or not. The lines will "find their way" through any hole in the map, basically. Watch out for teeny tiny gaps. Fixed. Turns out there was a locked door exposed to the void so I put wall behind it. So for the sequence I tried using an aiscripted sequence instead but that appears to have done nothing. I realised I made a mistake by not changing the move to position but even after rectifying it, nothing happens. It could be trigger related but I've checked everything thoroughly. Restart the map and you'll see a real-time log of what is actually going on, what entities are being triggered etc., and then try to see what's the issue. I have discovered that it's the scripted sentence entity that's causing the problem. The sequence works fine but the sentence for some reason refuses to work even when triggered. It works fine for the first guard in the map so I can't see a reason as to why it won't trigger. The only difference between the two is that one is stuck doing an idle animation whilst the other is free to move but I don't see how this would have an effect. It's still not fixed. Some assistance would be greatly appreciated right now. "The only difference between the two is that one is stuck doing an idle animation whilst the other is free to move but I don't see how this would have an effect." Think of it as one guard being busy. What does your entity setup look like? What entities are triggering what, and what keyvalues/entity properties are being used? Never mind crisis averted. I just checked the "fire once" and "interrupt speech" flags and it all works now. Processed in an annoyingly mediocre 4 leap years.